We wouldn’t have a complete series without some mention of physicians and their practices. They are, after all, an essential component of the health care system. Some measures of their capacity, and their perceptions of quality deserve to be recognized in this series. So let’s begin. First up, how well prepared are physician offices with respect to modern technology for quality improvement and practice management? 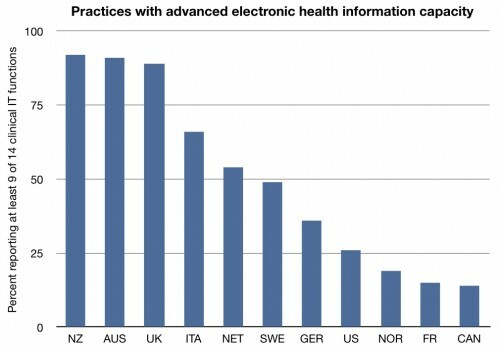 It should come as no surprise to anyone paying attention that the US is surprisingly deficient when it comes to electronic medical records. While I am not convinced of the cost savings of EMRs in all settings, many studies have shown that they increase the potential for quality improvement. Still not so good. Very much towards the bottom. Given the rhetoric of how much physicians hate reform, you would think doctors were very happy before reform passed. You’d be wrong. 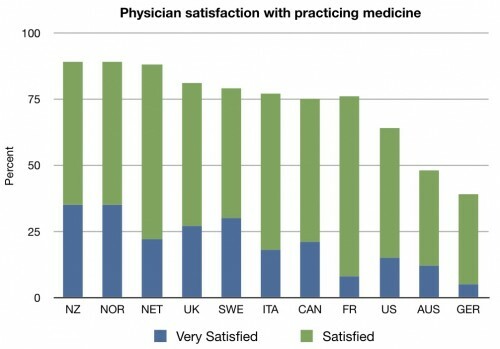 With the exception of Austria and Germany, fewer doctors were satisfied with practicing medicine than any other surveyed country. 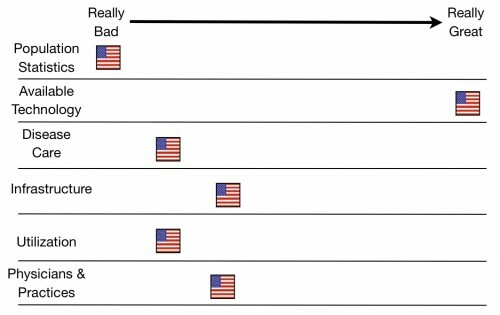 Here, the US is more towards the middle. Only about a quarter of physicians in the US think that the quality their patients have been experiencing has worsened in the last three years. 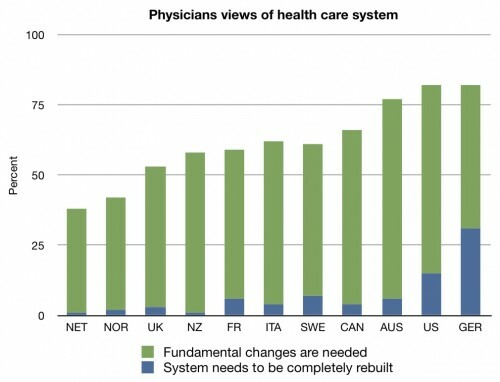 With the exception of Germany, more US physicians felt that the system needed to be completely rebuilt than physicians in any other country. 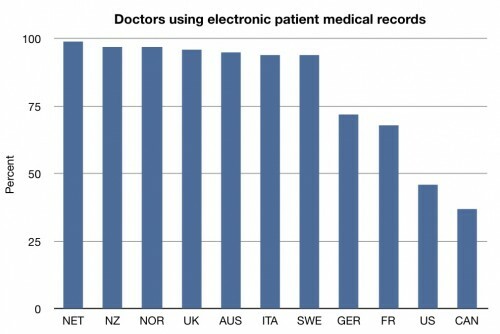 And the US tied with Germany for last in numbers of physicians who thought the system needed a total reboot or fundamental changes. So how do physicians and practices make our system look? We’re pretty deficient in terms of information technology, physicians are unsatisfied with their work, and their views of the quality of patient care and the health care system range from mediocre to terrible. Not a ringing endorsement. Our access to patient data in the US system is awful. If someone shows up needing urgent surgery at my hospital, and they have records at the hospital 6 miles away, but not in our system, it is almost impossible to get information on the patient. If there is time, I can send a family member over. If not, I often end up winging it. If their information is in some private office, the chances of getting that data is less than 50% (yes, we kept track for a while). To Aaron Carroll: Have read with great interest your myth’s about the Canadian Health Care System. Nicely written. I am a Canadian 69 years young in great health still working and operating a business. 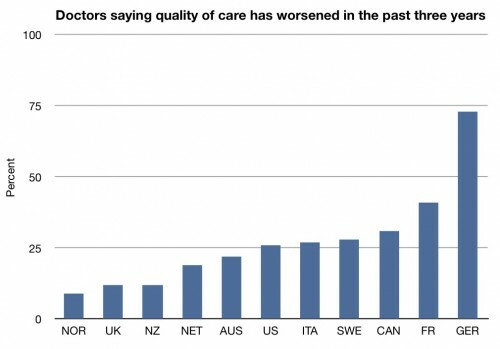 My personal opinion is that the Canadian Health Care System would not work in the USA. My reasoning is just based on numbers. The total population of Canada is not quite 35 million spread across seven time zones and the second largest land mass in the world. The Population lives in a ribbon coast to coast to coast Atlantic, Pacific and Arctic Oceans. 7,250 km long and about 100 miles wide. California has a population of about 35 million. In the summer Canadian temperatures are over 100 F and in the winter some places are 50 below. The population of the USA is 320,000,000 million. Germany population 82,000,000 France 63,000,000 UK 62,000,000 So just based on numbers of people the USA cannot copy other countries. In Germany where my grandchildren live when they go to the doctor and require drugs the doctor gives them the drugs from the doctors office. The doctor has their own pharmacy. Big cost difference. Big saving. In Canada over 65 years old drugs are very inexpensive. In Canada many drugs are on the shelf no prescription required. Huge savings. In the USA the pharmaceutical companies have the insurance companies the governments, state and federal and companies in a cash war. Drugs are over priced, despensing fees are over priced and therefore the system is broke and no one can straighten it out because it is built on $$$$$$ big money. The USA Medical System everything has a large USA cost due to supply and demand which is totally out of control. All of my Doctors in Canada were trained and came from South Africa – specialists, surgeons, GP everyone. South Africa’s loss Canada’s gain. So the USA is on its own to figure out how to show some healthcare compassion. The costs have to drop and the people in the medical field will have to work harder lowering the cost of everything. Co-operation, compassion for your fellow man would be a great place to start. Getting along with one another would be a good start. Shaking your brothers and sisters hands and stop spending so much time hating one another. My Uncle bought all the drugs for all the downtown hospitals in a major Canadian city. The hospitals opened a co-operative and received a distribution discount from all the drug mfg. Slashed 40% to 50% off the top immediately. Can you imagine the savings directly to the bottom line if the all middle man were removed from the USA medical distribution network? I am an American born in this country and became a dual citizen in Canada in the 1980’s. I have liven in Canada off and on for 17 years. I currently live in the United States. When I returned in 2008 the debate over health care was in full flown debate. I was appalled by what people like Rush Limbaugh was saying about Canada and England. His sources were bogus. I had some of the best health car in Canada that I have ever had. It was quick in response and thorough and it did not cost me large amounts of our of pocket expenses. I just had prostate surgery and the bill to the insurance company was close to $100,000. My cost is more than I can afford so I will pay $25.00 a month. A shame in a country as large and powerful as ours!! My Synthroid medication in Canada was $8.00/mo in the US it is $28.00/mo with my insurance!! Our failure to be a forerunner in cost effective health care is litigation and insurance costs. I did not notice the lawsuits in Canada compared to what is seen in the US. In fact the TV here is filled with Lawyers ads begging people to come to them to be compensated even if they only think they might be entitled. I did not see that in Canada. I wish we could come up with something better. I am in debt from my surgery as I have never been in debt at any point in my life. I am considering returning to Canada because I know I could never afford to live here and have health issues. I am 60 years old and have always been in relative good health but the future will hold inevitably more health issues.